I cannot say enough good things about Natalie and how she got me to finish an Ironman. She is a fantastic coach and great mentor. If you are going to tackle this race, she should be your coach. 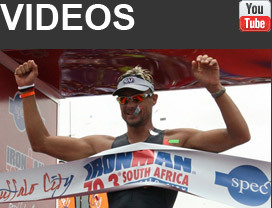 Why Ironman: I have always been fascinated by ultra events. Turning forty, I wanted a stretch target to commemorate the occasion. Ironman seemed to be a great idea and a proper stretch for somebody that was 10kg overweight and had not cycled since university. I thought I had done my research before embarking on this venture, but as it turned out I was in for quite a surprise: I had been warned about the 25 hour training weeks (to be fair, there were only a few of them!). However, nobody mentioned the extra sleep my body would need to cope with the physical stress (2-3 hours more a night), and the fact that in the beginning you are hungry all the time and could easily eat an arm if nobody hands you a chocolate by 3PM, making it very easy to gain weight rather than lose it. Certainly nobody warned me that I would end up unable to tolerate alcohol (to be clear – I run for wine)! But by the time that I had invested the price of a small car into a bike that still required pedalling, had gotten myself a pilates coach, swim coach and tri coach, put my physio’s kids through private school and had gone far enough down the training path that everything hurt all the time, there was no turning back. Why Natalie: I did two half Ironmans in preparation for the big race (both the Midlands Ultra 70.3). With the first attempt (December 2013), I knew that I was nowhere near fit enough, and solidly missed the cut-off by 45 minutes. So I dedicated the December holidays to some serious training, and the second time around I was much better prepared (March 2014). However, leading up to the race I ended up with two weeks of roughly 15-hour work days, including three all-nighters. This resulted in little training and even less sleep. During the swim it felt like I managed to drink half the Midmar dam, and quickly learnt that my new race nutrition plan did not agree with me. The long nights at the office finally caught up with me 70km into the cycle, when I found myself falling asleep on the bike. It was a spectacular blow-up. My tri-coach at the time had been critical of my "work life balance”, and was quick to point out that unless I dedicated more time to my training and less time to work, they did not believe I would finish a full Ironman in June. Suffice to say that I disagreed with that view. I was not about to risk my career for the sake of a mid-life crisis. By the same token, I also had no intention of giving up on Ironman three months before the race. That is when I was referred to the Tissinks. The training: Natalie handled the call asking if she would train me with three months to go as if it were the most natural request in the world. She was clear on what she believed it would take to get there, but very willing to work with the demanding timing of my work schedule. She planned sessions around travel dates, and structured the training to accommodate work-related and personal commitments. There was enough flexibility built into the program that the sessions were manageable in the course of a week. Most importantly, she believed in me. Natalie has an incredible gift to take a situation, boil it down to the facts that matter, and put it in perspective. I found that the biggest challenge of a first Ironman was the fear of the unknown. Natalie was great at taking the key take-aways from training, and teaching me how those translate into what I should expect during the race. She really put the demons in perspective, and helped me to focus on those aspects that matter. And before I knew it, race day was there. Finishing the race: I finished Ironman Cairns on Sunday, 8 June 2014. It was an incredible journey. You learn a lot about yourself, and of how much your body is capable. I owe a huge debt to Natalie for getting me past that finish line on time, without injury, when others had said there was no way. THANK YOU NATALIE!! !